With the leaves turning and a nip in the air, I was craving a one-dish meal that would bring fall to the table. I am not a lasagna baker but I enjoy other people’s family recipes. 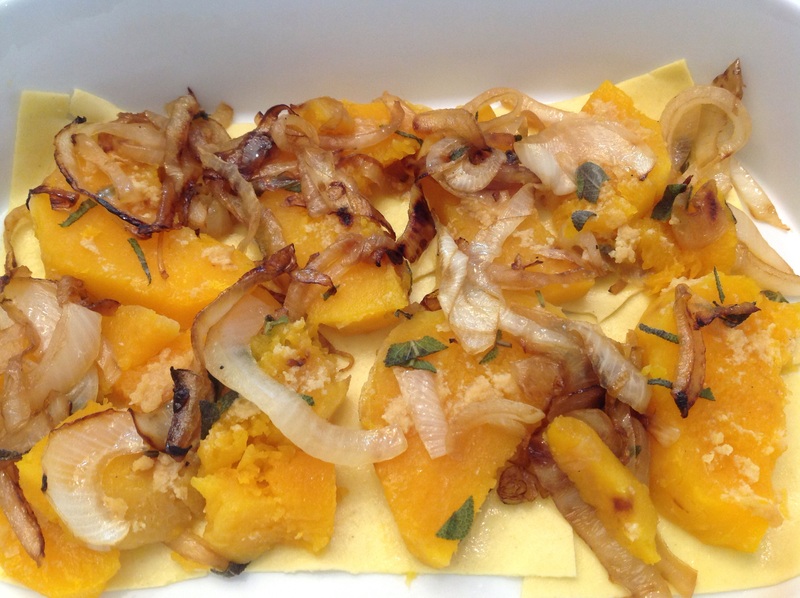 After reading several recipes for seasonal butternut squash lasagna, I was motivated to try my hand at one. My version is loosely based on the recipe by Pippa Middleton, she of the famous sister and derrière, from her cookbook, Celebrate. Although a vegetarian dish, it is hearty and robust enough in flavor to satisfy most guests’ appetite. You could substitute other types of squash or pumpkin but butternut is my favorite squash. The combination of squash, kale, caramelized onion, sage and Italian cheeses enveloped in creamy layers of béchamel sauce result in rustic flavors, perfect for fall entertaining. The lasagna can be made a couple of days in advance or even frozen, before baking, for up to 3 months, making it a no brainer for stress free entertaining. 1- Cut the squash in half and reserve the seeds. Coat the cut surfaces with a little oil, salt and pepper and place on an oiled and lined baking sheet, face side down. Roast for 15 minutes on the bottom rack. Remove from oven and let cool enough to handle. Peel the squash and slice in crescents about a quarter inch thick. Return to baking sheet, add the onions, garlic, and half of the chopped sage leaves. Bake another 30 minutes, stirring occasionally so the onion does not burn and caramelizes evenly. Reserve. 2- In a sauté pan, sauté the kale in a bit of olive oil until the moisture is absorbed then season with salt and pepper to taste. Reserve. 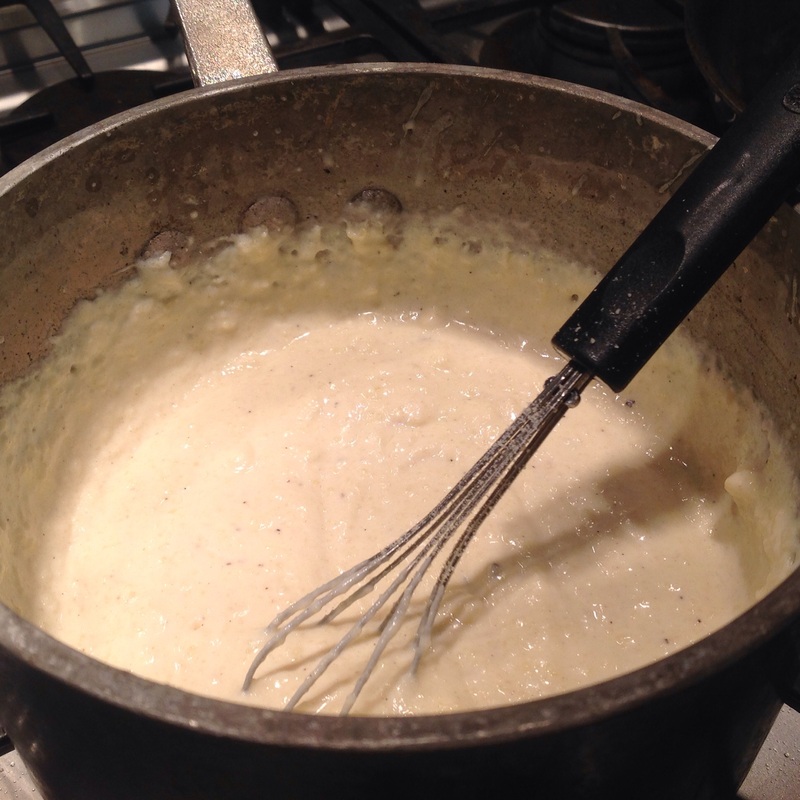 3- For the béchamel, in a saucepan, melt butter, add flour and stir to make a roux. 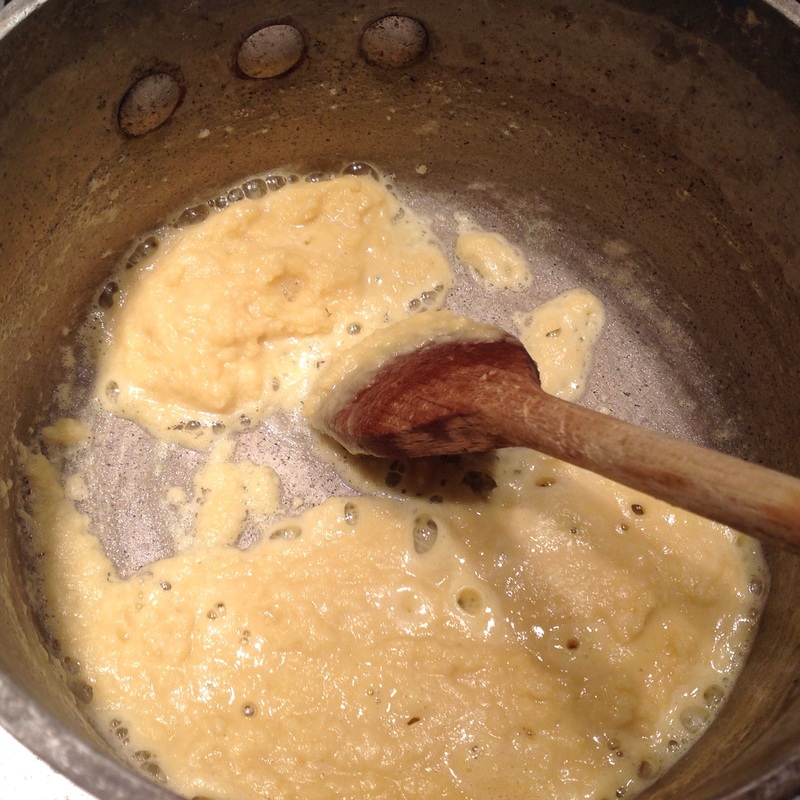 Gradually add the cream, whisking continuously until a smooth consistency is achieved and sauce is thickened. Add the nutmeg and 3/4 cup of parmesan and whisk to blend. Reserve. 4- In a pot of boiling water, blanch each sheet of lasagna, remove and dry off. You will have 3 layers of pasta. 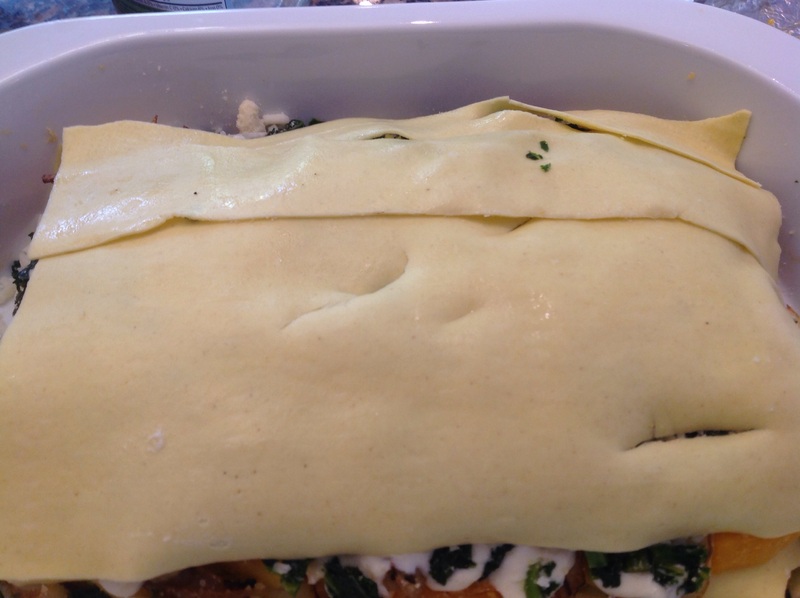 In a lasagna pan, place 1 sheet of lasagna and about half of another to fill the width of your dish. Top with a layer, about half, of the squash mixture. 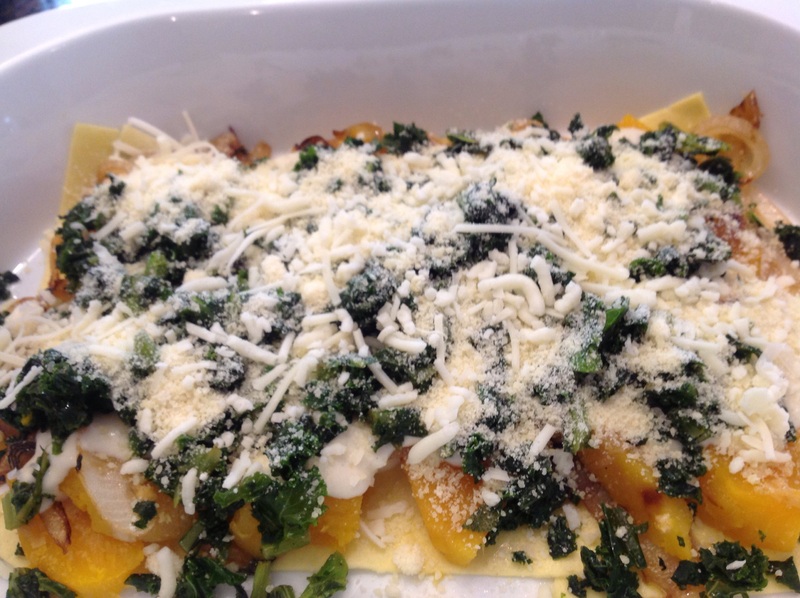 On top of the squash, layer one third of the béchamel sauce, then half of the kale. Sprinkle 1/3 cup of parmesan. Repeat. 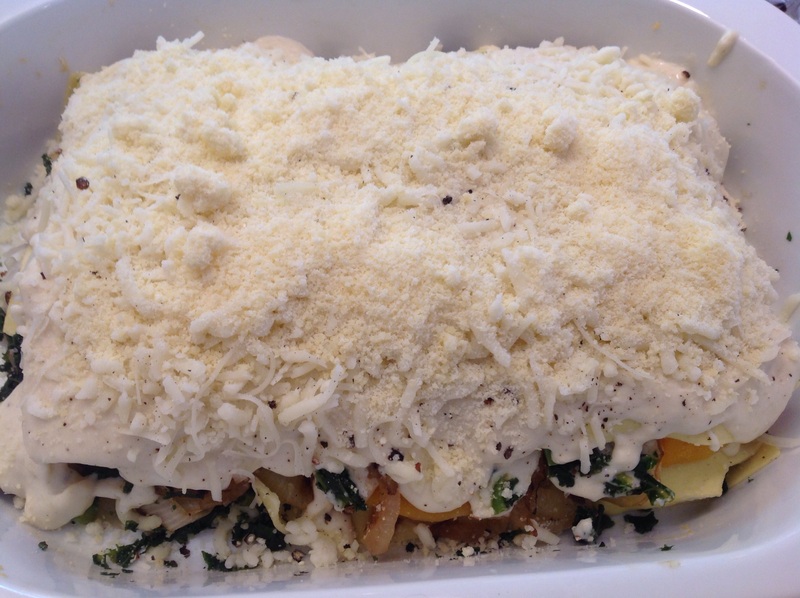 Finish by laying another layer of lasagna noodles and topping this layer with the rest of the béchamel and all of the shredded cheese blend. Reduce oven temperature to 375F and bake in the center of the oven for 30 minutes until bubbly and golden. If baking from a frozen state, defrost before baking. In a pan, heat some olive oil and flash-fry the whole sage leaves, for about 1 minute. Drain on a paper towel and reserve. Squash seeds are really tasty roasted and a nice topping for this dish. 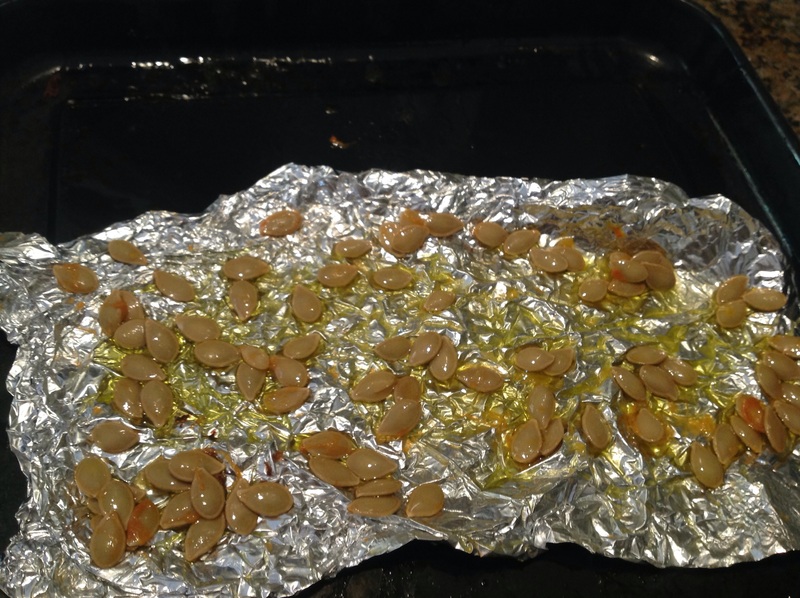 To roast the seeds, clean off membranes and toss in a little olive oil. Bake on a foil lined sheet at 400F for 3-5 minutes, stirring once, until they are golden. Drain on a paper towel and season with sea salt. 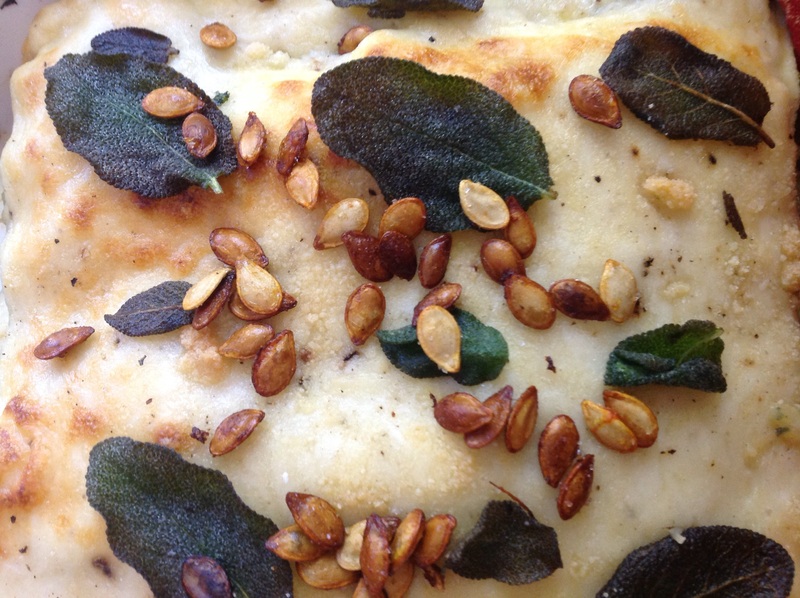 When ready to serve, garnish with the fried sage and toasted squash seeds and a green salad. Lasagna will serve 8. Cooking the squash and onion filling. 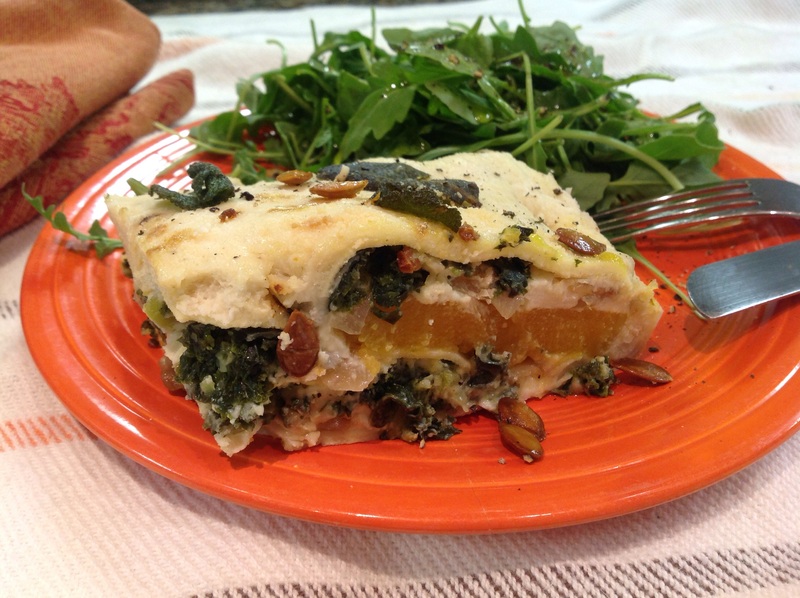 This entry was posted in Entertaining, Recipes and tagged béchamel, butternut squash and kale lasagna, Fall lasagna, roasted squash seeds, squash and kale lasagna by Johanne Lamarche. Bookmark the permalink. Looks amazing. I will try this. Thanks for sharing. It was my first lasagna try and it was really good. Loads of garlic and thise caramelized onions…yum. Thanks for visiting today! I just forwarded the link to this recipe to my soon to be niece-in-law! I know she’s going to love it! I’ve never eaten butternut squash or kale; but as a vegan, I know she lives for it! That is why they make cocolate and vanilla ice cream! I bet you would like this if you tried it Alycia….LOL I appreciate you still commenting! Hope you are feeling better this week. Enjoy your weekend too 🙂 did you see Gone Girl yet? Not usually a fan of lasagna, this one really looks different. 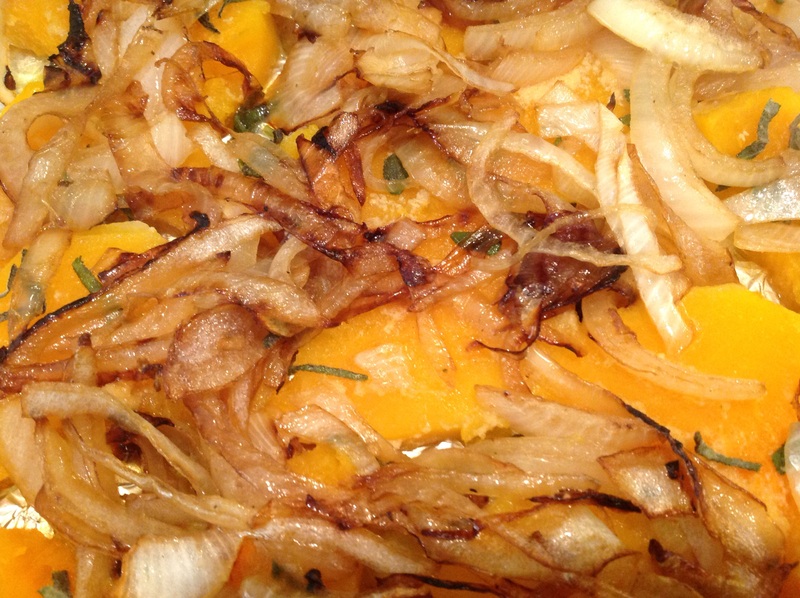 I’m sure the sweetness of the squash and caramelized onions are super with the cheese. And I love that it can be made in advance. Your garnishes are also brilliant. I would be delighted to be served this, but just might have to make it myself. Have a lovely weekend. It is definately not the usual lasagna Hilda. We loved it, especially with those garnishes. 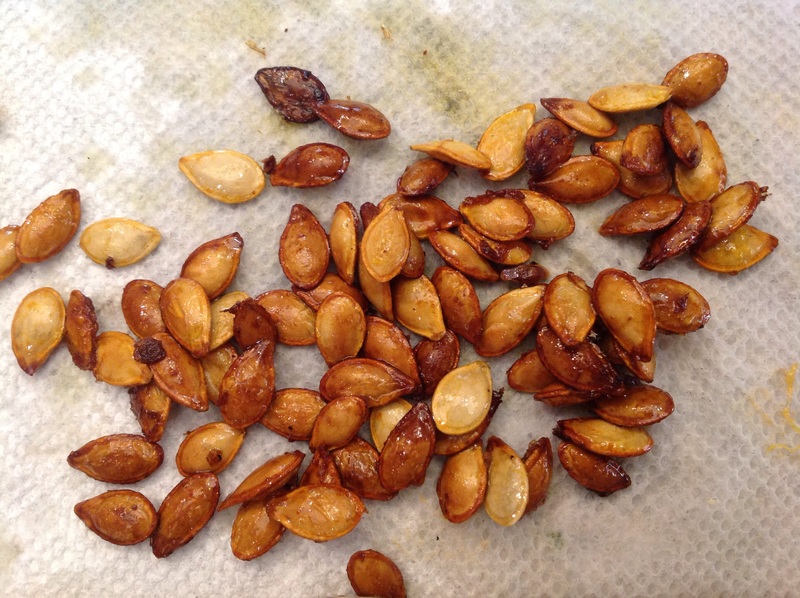 Have you tried toasted squash seeds? So good! Indeed. I love toasted squash seed, and your idea of using them as a garnish is very helpful. Those toasted seeds are delicious as a snack or to top salads. Most of the time we just throw them out but they are yummy and can be seasoned in all kinds of way. I hope you’ll try them. 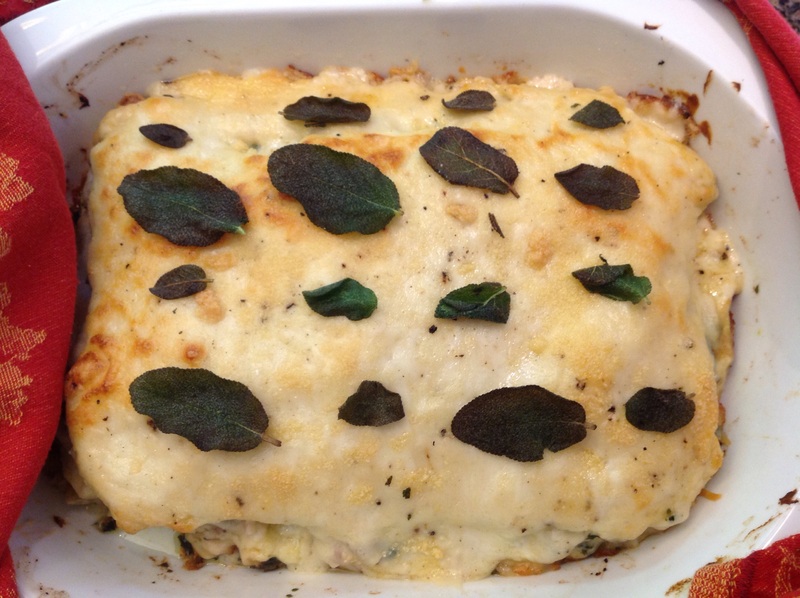 yum, two of my favourite foods in a lasagne!